As Much as I Love a Dumble, No Way Would I Pay $50k! A good buddy sent this eBay auction to check out: http://www.ebay.com/itm/271149509473?_trksid=p5197.c0.m619. As of this writing, the bidding is up to $50k. Yikes! I’ve played a Dumble ODS. The sound and dynamics are, in a word, magic, and I haven’t found anything in all the amps I’ve played since capture that magic. In the videos I made of the amp, I said that I think based upon playing it that it was worth the money. Sebago Sound Releasing a Steel String Singer! Got a call over the weekend from Bill Dunham at Sebago Sound who wanted to tell me that he was releasing a Steel String Slinger based upon the topology of a SSS owned by a well-known, grammy-award-winning, blues/pop artist (I know who it is, and based upon the description, you should be able to figure it out). Don’t have a lot of details on it right now, though I will be doing a demo/review of his pre-production prototype. I’m excited about playing around with the on-board reverb that is in its own loop to control the signal going in and out of the reverb unit. Very cool. From what I know of the original SSS, the amp is a single-channel amp, but has two inputs: Normal and FET. The FET input is like having an on-board overdrive. Having played with a real Dumble, that FET circuit is pretty special. The prototype will not have this feature, though Bill does have plans to put that in. For more information on the Sebago SSS, check out Sebago Sound! In other news with Sebago, Bill has done a fantastic job of creating Dumble clones with his Double Trouble 50 and 100 Watt amps based upon the Dumble Overdrive Special. But more importantly, unlike other boutique Dumble cloners out there such as Two Rock and Bludotone, Bill’s mission is to create Dumble-style amps and not charge a premium. For instance, Sebago’s 50 Watt Double Trouble is only $1995. Believe me, it’s a well-made amp, and the retailers who carry that amp can’t keep it on their shelves for more than a couple of days. I’m not quite sure what the price-point for the SSS will be, but it will be far less than the competition; and you won’t have to wait more than a couple of weeks at most to get one, as opposed to having to wait up 18 months for other builders’ Dumble-style amps. So lower price, short wait time (if any, if you get it from one of the local retailers)? Kind of a no-brainer, if you ask me… In any case, stay tuned for my review! 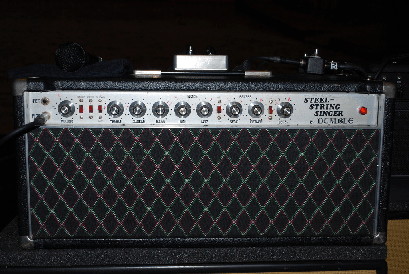 I’m getting the amp tomorrow evening and will be playing with it for the rest of the week. There’s something about “Fender” and “high-gain” that seems like an oxymoron. Most people equate the Fender tone with lush cleans and open, low-gain overdrive. They’ve tried to break into the high-gain market in the past with the ProSonic and SuperSonic models, and they haven’t fared too badly, considering the likes of Matthias Jabs of the Scorpions uses a ProSonic. But it’s hard to break through an image, decades-long in the making. To help “cut” (pun intended) through that image, Fender recently released the new Machete. This is a two-channel, 50 Watt, 1 X 12 combo that has the capability of producing the classic Fender cleans we all know and love, to some very high and over-the-top high-gain tones. Each channel has independent 3-band EQ. But there are other features that will help players dial in their tones such as an input pad switch for use with guitars with active pickups; a Notch control that changes the midrange point, and a Damper control to roll off highs. It’s very cool-looking with that 60’s-70’s, black, retro styling. But it does cost around $1900. That’s actually not too bad of a price, but it’s not cheap either. That’s the other image thing with Fender. They’re known for inexpensive gear relative to their competition. I suppose if they’re competing against the boutique manufacturers, then they’re staying true to that practice. However, most popular boutique amps follow a more vintage path to tone. I suppose they could be going after Soldano and Hughes & Kettner for high-gain. No matter, it’ll be interesting to see how this amp fares in the market. In a historic collaboration, Fender introduces its first artist signature amplifiers—EC Series amps bearing the name of legendary guitarist Eric Clapton. Built to the exacting specifications of Clapton himself, the three amps—the EC Twinolux™, EC Tremolux™ and EC Vibro-Champ®—are fascinating variations on their original ’50s-era ancestors (the ’57 Twin™, ’57 Deluxe™ and ’57 Champ®, respectively), and are our answer to his call for special models with distinctive features. Handmade in the United States, all three amp models feature ’50s—era output tube bias tremolo (which produces a more throbbing pulse than later Fender tremolo circuits) and a switchable power attenuator (reduces speaker output), in addition to other premium features. In a historic career now in its sixth decade, Eric Clapton has long been known as one of the world’s foremost exponents of classic Fender tweed amp tone, and the three new amps bearing his imprint present the pinnacle of personally inspired amp tone for stage and studio alike. Each is a must for Clapton fans and guitarists who want the ultimate in tweed tube amp performance. I dig that each has a built-in attenuator, and each has tube tremolo, which I totally dig. I have a tube tremolo on one of my Aracom amps, and it is suh-weet! For more information, check out the Fender site!